Hello and thank you for visiting our ScreenCloud Help Center. This article will go through how to copy a playlist from one team to another using the Users & Teams function on ScreenCloud. Currently, you can only copy all data from one team to another - this would include all playlists, pieces of content and schedules. Additionally, if you're looking to transfer ownership of your account to a new user, please click here to learn more. To duplicate content, playlists and schedules between teams you can use the “Copy Data Between Teams” feature on the Users & Team page. 3. 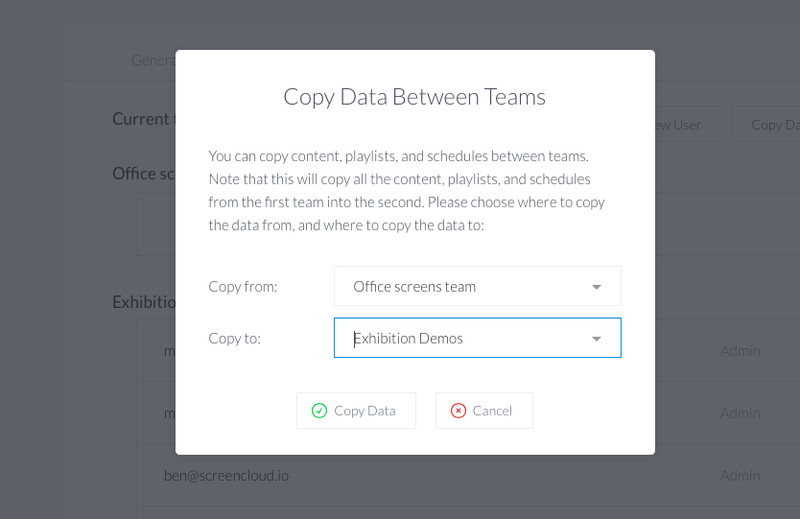 Select “Copy Data” and all playlists, schedules and content will be copied to the chosen team’s account. If you have any additional questions or concerns on how to copy a playlist from one team to another, or any other questions or feedback about ScreenCloud, feel free to reach out to our support team at support@screencloud.io or give us a call at +1-415-449-5426, then follow the prompts to reach support.